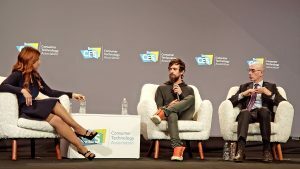 The NBA is the largest community in the world on the Twitter platform, and Twitter CEO Jack Dorsey and NBA Commissioner Adam Silver took to the stage at CES last week to discuss this burgeoning relationship. They looked at how the league found success, and the launch of a Twitter simulcast that involves users’ voting for which player they want to see covered live on Twitter with an iso camera. Silver said that, since the NBA launched on Twitter in 2009, it has become a 24/7 place for news and more related to the league, its teams, and players. He noted that Twitter helps the league connect to younger audiences that may not subscribe to pay TV, giving them a chance to see pregame warmups or postgame news conferences. At an event like CES, he added, the technologies that open up new avenues for content delivery are on display. With more than 1 billion people somewhere in the world watching a portion of an NBA game on TV last season, clearly, there is no cannibalisation from Twitter. Helping in the effort is that NBA players have embraced the platform and take their presence on TV and build on it online.